AFTER SELL-OUT SHOWS IN MELBOURNE, ADELAIDE, SYDNEY & CANBERRA & BRISBANE, WE’RE COMING TO YOU! 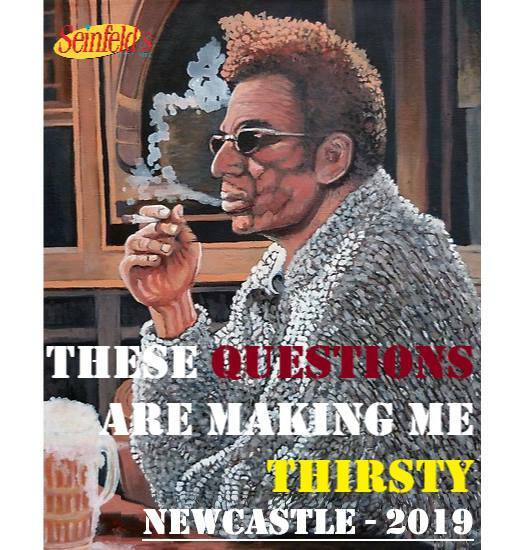 Come to the WALLSEND DIGGERS for Australia’s biggest Seinfeld trivia night and revisit this gem of a show! We have been locked away working tirelessly to put together a completely NEW SHOW and reckon we’ve got something very, very special for you. Questions will come from all 180 episodes and will cater to everyone from the casual observer, to the greatest Seinfeld tragic out there. The key theme for the evening will be FUN! ……and Seinfeld. Leave it to the masterful chefs @ THE WALLSEND DIGGERS to take care of dinner from our shamelessly themed SEINFELD FOOD & DRINKS MENU. Hilarious Seinfeld themed games & prizes to be won throughout the evening as well as for 1st, 2nd, 3rd & last place. Bonus prizes will be awarded for BEST DRESSED, so get creative!! We hope you’ve seen photos of the lengths people have gone to so far… The bar has been set high!